I realize it has been a while, so my apologies to the two of you who occasionally read from my satirical ramblings. I have decided that for the next couple of days I am going to give a snapshot through my eyes of each of the Presidential candidates. 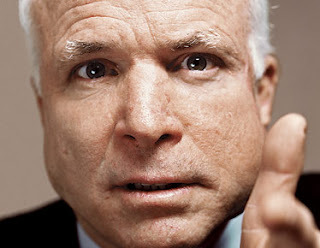 My first will be of John McCain. That gritty smile and dimpled cheek that hangs over his left side like Jay Leno's chin charms and captivates the elderly and few remaining veterans who support him. His little wink and that twinkle in his eye reminds me of Santa Claus crossed with Bob Newhart. Captain of the "straight-talk express" he toots the horn and talks about pork-barrel spending and how he loves the surge. He winces at such 'a' words as "amnesty," but he does so now, because he doesn't believe in it. Fining criminals and letting them roam the streets in front of millions of law abiding citizens who want to do the same isn't a free ride...it's the American way. We're all immigrants right? He makes everyone happy, including most independents and democrats, but the party he's running for doesn't seem to give a damn. Maybe it has something to do with his extra-marital affairs with Ted Kennedy and Joe Lieberman.